Matt Cooper, a.k.a Coop, is a nutrition consultant, strength & conditioning coach, and sport scientist from California. Driven by an obsession to expand human performance, Coop spends his time researching, experimenting, doing nerdy things, and building better humans in general at Stand Out Performance (Fast Twitch LA) in Compton, California. Coop’s own personal journey began in athletics and fitness, until poor health and mental states befell him at an early age. This lead to him to become his own practitioner, and fuels his current work, marrying functional medicine and human performance to create suprahumans. In this episode, we talk about psychedelics and human performance, training from a holistic perspective, mega-dosing and bio hacking with nutrition, why stress is a habit that can eventually embedded trauma into your nervous system, signs of overtraining and what this does to your equilibrium, tips to athletes who have hit a wall, how psychedelics can improve athletic qualities by accelerating learning skills, and more. Vuori Clothing provides a new perspective for athletic clothing. 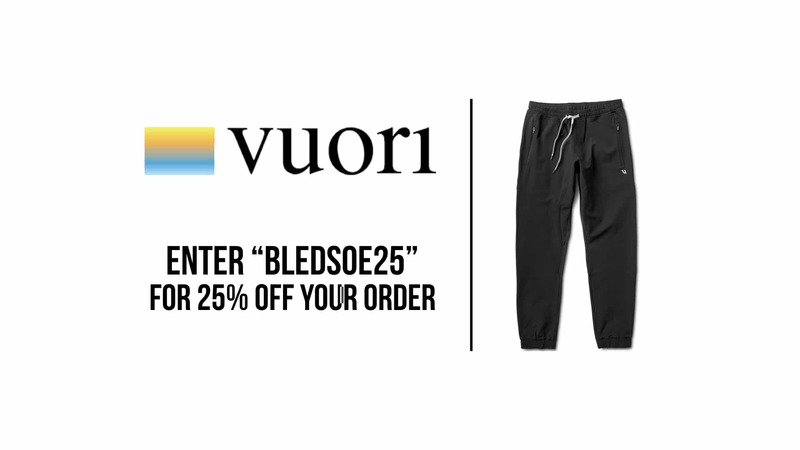 Vuori is built to move and sweat in, designed for an active lifestyle. Use code: BLEDSOE25 for 25% OFF your order.